Samsung's latest smartphone takes the best bits of last year's Galaxy S6 and combines them into a curved phablet with the dimensions of a normal-sized phone. It is this version that the Galaxy S7 Edge takes its design from. Side-by-side they look barely any different apart from a bigger screen - 5.5in to the older 5.1in - and the back now has rounded edges. The screen is the best I've ever seen fitted to a smartphone. Period. It's pin-sharp with deep blacks and rich colours. It has a great range of brightness, taking it from really very dim to bright enough to see in direct sunlight. Overall, the Galaxy S7 Edge is great for watching movies on the go. Eager to enjoy your favorite DVD movies on Galaxy S7 Edge? 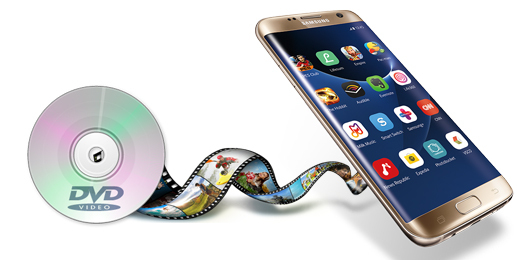 This article will tell you how to get DVD playable on Galaxy S7 Edge. I think we do not need to discuss the reason deeply why Galaxy S7 Edge does not afford DVD movies directly since it is easy to find out: common smarthones or tabs like iPad, iPhone, Samsung Galaxy Tab, Galaxy S7 Edge don't have a built-in DVD-ROM or DVD player. According to Samsung official website, Galaxy S7 Edge supports MPEG4, H.263, H.264, DivX, XviD and WMV videos. To watch DVD movies on Samsung Galaxy S7 Edge, you need to convert DVD to MP4 or other Galaxy S7 Edge supported format first. As one of the best DVD Ripping software, the program - EaseFab DVD Ripper is easy to use and can help you rip DVD movies to Galaxy S7 Edge supported video format MP4 without quality loss. With it, you can fastly convert commercial DVD movies as well as ISO/IFO files to Galaxy S7 Edge, Galaxy Tab 4/3/2, Galaxy Note 5/4/3 or Galaxy S4, S5 supported video format. If you are a Mac user, please turn to EaseFab DVD Ripper for Mac. Converting DVD to Galaxy S7 Edge with EaseFab DVD Ripper is simple as ABC. After downloading, follow the wizard to install and run the program. Then follow the steps below to rip DVD to Galaxy S7 Edge playable videos in a few clicks! The below guide takes DVD Ripper for Windows (Windows 10 compatible) screenshots for example. Insert the DVD disc into your computer's DVD drive and click the "Load DVD" button on the top left to select and load the DVD movies you want to edit in PowerDirector. ISO and IFO files are also supported. After the movies are loaded, you can preview them on the right viewing window and adjust volume or take snapshots freely. Next, select a proper output video format. Click "Profile" and select "Galaxy S5"from "Samsung" category. The output videos fit Galaxy S7 and Galaxy S7 Edge nicely. 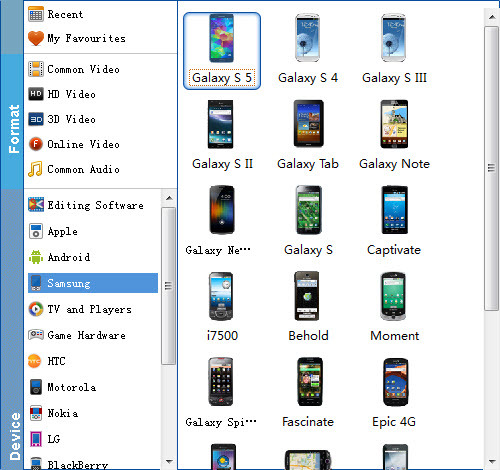 You can also choose the "Android Phone" preset from "Android" category. Tip: If you're not satisfied with the output quality, you can click on settings you could easily set bitrate, frame rate, codec, channels, sample rate, etc to adjust parameters that affect video quality and file size for the video you prefer. keep in mind that bitrate higher results in big file size, and lower visible quality loss, and vice versa. For watching DVD videos on Galaxy S7 Edge, 720p with 2000~2500kbps is just all right. When you have finished all the above settings, you can simply click the Convert button on the main interface and let the software do the DVD to Galaxy S7 Edge conversion for you. After the conversion, click "Open Folder" to locate the converted video files and then transfer them to your Galaxy S7 Edge for watching on the go with ease.